Agile Scrum is one of the most useful methodologies considering today’s challenging business environment. A large number of organizations use agile principles by now. Team members of the agile and scrum teams play key roles in the organizations. Therefore, HR managers seek candidates with well knowledge of Agile and Scrum principles. Whether you are called for your first job interview or you are an experienced team member, it essential to prepare yourself for some frequently asked Scrum Master Interview Questions and Agile Interview Questions. There are many career opportunities in the area of agile in the IT market and applicants are going through the interview to get a better job in that field. Since the boundaries of Agile and Scrum are enormous due to vast coverage and multiple flavors, it becomes challenging for applicants to prepare for the job interview. 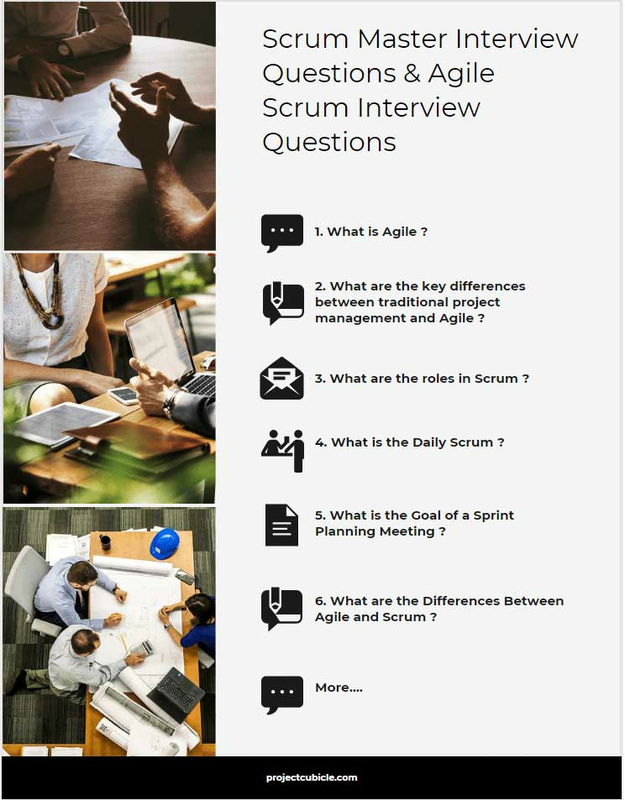 In this article, we will focus on the common and frequently asked questions for agile scrum and scrum master interviews. 1. What is Agile ? Give a Brief Description. Agile is a set of management practices and approaches that encourage “just-in-time” production in software development. 2. What are the key differences between traditional project management and Agile ? Waterfall is a sequential model in which you complete one process and begin the next one. Design, development and testing phases follow each other. On the other hand Agile methodology segregates the project development life cycle into sprints and these sprints are performed simultaneously. This provides flexibility to Agile for changing project requirements, as they occur. There are three main roles in Scrum which are the Product Owner, Scrum Master, and the Delivery Team. Scrum roles differ from traditional project execution roles. Product Owner : Is the holder of the product value who defines what needs to be done and the priorities to deliver the highest value. Scrum Master: Is the one who is responsible for promoting and supporting Scrum. Helps theam to understan the basics of Scrum. Development Team: Is a collection of experts working together to build the requested product. 4. What is the Daily Scrum (Daily Stand-Up) ? Daily Scrum is an essential concept of Agile. Therefore you may face a few questions regarding to Daily Scrum (Daily Stand-Up). Daily scrum is a daily short meeting in which participants typically attend while standing. Are there any impediments that keep you from doing work ? 5. What is the Goal of a Sprint Planning Meeting ? Sprint planning meeting is hold at the beginning of each sprint in which all the team members participate. The goal of the sprint planning meeting is to select the set of product backlog items that will be delivered during the sprint. 6. What are the Differences Between Agile and Scrum ? Agile is a set of management practices and approaches that uses iterative approach for software development. On the other hand Scrum is an approach which includes specific set of rules to be followed while implementing Agile. Scrum is a framework which prescribes roles, events and rules to implement Agile. There are some other Agile frameworks like Scrum such as Kanban, Extreme Programming,Test Driven Development and Feature Driven Development. 8. When do you use Waterfall instead of Scrum ? Waterfall is a useful method for projects with well defined scope and requirements. It is applicable if all the requirements are completely understood and will not change. 9. Can you describe the burn-down chart ? A burn-down chart is a graphic which is used in agile to understand when all of the work will be completed. Simply put, it demonstrates the amount of work a team has completed through—such as hours during the sprint. 10. Have you managed more than one Scrum Team ? Note that this is a misleading question. Because Scrum Masters lead the teams, they don’t manage. The aim of this question is that the questioner tries to understand if you are aware of this difference. One scrum master is ideal for one scrum team. However, in some circumstances, a scrum master may be required to lead two teams. 11. What is a Sprint Retrospective ? 12. What is the duration of a sprint ? Duration of a scrum sprint depends on the size of the scrum team. A scrum team may involve 3-9 members. A scrum sprint may vary from one to four weeks. 13. Can you give examples of impediments in Scrum ? Impediments are the obstacles that a Scrum team may face during the performance of the work. Lack of knowledge, technical, operational issues, lack of management supporting system are the examples for impediments in Scrum. 14. Have you heard Scrum ban? Scrumban is a Scrum and Kanban based methodology for software development. Therefore, it contains the characteristics of both methods and aims at continuous improvement. 15. What is Agile Testing ? Agile testing is a software testing system that relies on the principles of software development. It is an iterative process which prvides feedback to the development team during the development cycle. It incorporates agile principles and applications to meet the customer requirements. Customer satisfaction, continuous feedback, improved communication and error-free clean node are some of the principles of Agile testing. 17. Can you explain the “Velocity” ? Velocity is one of the common metrics of Agile. It can be defined as an average number of points from last 3-4 sprints. It provides an idea of the capacity and the progress. 18. What are the other common metrics of Agile ? Can you give examples ? 19. What is “Planning Poker” technique ? Planning Poker ( or Scrum Poker ) is a consensus based approach for estimating the efforts for a task. Typically a session of a Planning Poker involves team members and product owners. They propose estimation values using poker cards and then finally everyone agreeing to one value. 20. What is backlog ? A backlog involves user stories and tasks that the team needs to work upon in future. A backlog can be categorized as product and sprint backlog. Agile and Scrum methodologies are helpful to accomplish a project at earliest with high customer satisfaction. In this article we listed some of the most common Scrum Master Interview Questions and Agile Interview Questions asked by the interviewers. If you have any question or share your experiences, use the comments box given in below. Previous articleBusiness Plan , How to Create a Business Plan ?